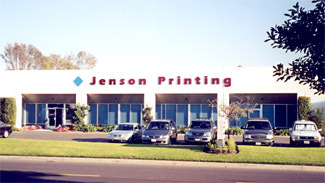 Jenson Printing & Litho is a full service printing company in Irvine, California. We are conveniently located less than a mile from the John Wayne International Airport. At Jenson Printing we specialize in commercial printing. Our specialty products include catalogs, booklets, brochures, posters, calendars, presentation folders, etd. etd. Our 11,000 sq. ft. facility boasts an impressive array of state-of-the-art equipments and staff of highly trained technicians who can help turn your printing and publishing projects into finished works of art.